Is the Economy Signaling a Sustainable Recovery? The U.S. economy has been looking for green shoots since the crisis ended, but has been getting mixed messages in response. GDP growth in the first quarter of 2014 came in at negative 2.1 percent, only to bounce back to 3.9 percent in the second quarter. Many question where the economy actually sits today, and whether we can sustain growth into the future. One place to look for some answers may be the bank lending that supports much of our economic activity. 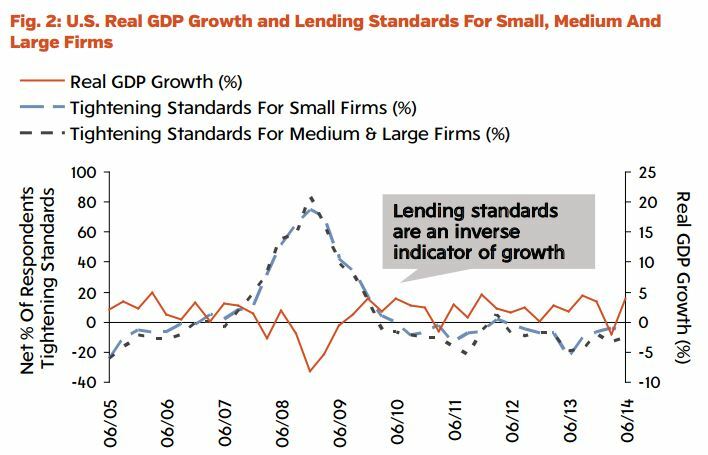 The following analysis looks at the correlations between U.S. commercial bank lending growth, change in lending standards per the Fed’s Senior Loan Officer Survey, and GDP growth.